We propose two different formulations of the Rasch statistical models to the problem of relating gene expression profiles to the phenotypes. One formulation allows us to investigate whether a cluster of genes with similar expression profiles is related to the observed phenotypes; this model can also be used for future prediction. The other formulation provides an alternative way of identifying genes that are over- or underexpressed from their expression levels in tissue or cell samples of a given tissue or cell type. We illustrate the methods on available datasets of a classification of acute leukemias and of 60 cancer cell lines. For tumor classification, the results are comparable to those previously obtained. For the cancer cell lines dataset, we found four clusters of genes that are related to drug response for many of the 90 drugs that we considered. In addition, for each type of cell line, we identified genes that are over- or underexpressed relative to other genes. The cluster-Rasch model provides a probabilistic model for describing gene expression patterns across samples and can be used to relate gene expression profiles to phenotypes. Recently, DNA chip or microarray technology has been developed that allows researchers to measure the expression levels of thousands of genes simultaneously over different time points, different experimental conditions or different tissue samples. It is based on the hybridization of DNA or RNA molecules with a library of complementary strands fixed on a solid surface. Oligonucleotide chips contain thousands of features with gene-specific sequences about 25 bases long. These oligos are then hybridized with labeled probe derived from a given tissue or cell line. The resulting fluorescence intensity gives information about the abundance of the corresponding mRNA. This is the Affymetrix DNA chip technology. Alternatively, cDNA can be spotted on nylon filters or glass slides. Complex mRNA probes are reverse transcribed to cDNA and labeled with red or green fluorescent dyes. This technique is often called the spotted array or cDNA array. In both methods, thousands of mRNA concentrations can be measured in parallel, potentially revealing complex gene regulatory networks. One important application of the microarray gene expression data in medicine is to study the relationship between tissue phenotypes and gene expression profiles on the whole-genome scale. The phenotype could be several different types of cancers [1,2,3], responses of cell lines to different chemical compounds , or time to tumor recurrence after treatment. For binary phenotypes such as two different types of cancers, the problem becomes the classification of patients' samples. It has been suggested that gene expression may provide the additional information needed to improve cancer classification and diagnosis . For continuous phenotypes such as drug sensitivity, the problem of interest is to relate gene expression patterns to sensitivity to drugs and, therefore, aid in the process of drug discovery and provide a rationale for selection of therapy on the basis of the molecular characteristics of a patient's tumor. From the statistical point of view, the challenge is that the microarray gene expression data are often measured with a great deal of noise, and that the sample size of tissues or cell lines, denoted by n, is usually very small compared to the number of genes in expression arrays, denoted by p. This results in the 'large p, small n' problem . Most current approaches to dealing with this problem first select genes that can best separate tissues of different types by performing univariate analysis. The expression levels of these genes are then combined linearly in a weighted way to form compound covariates. 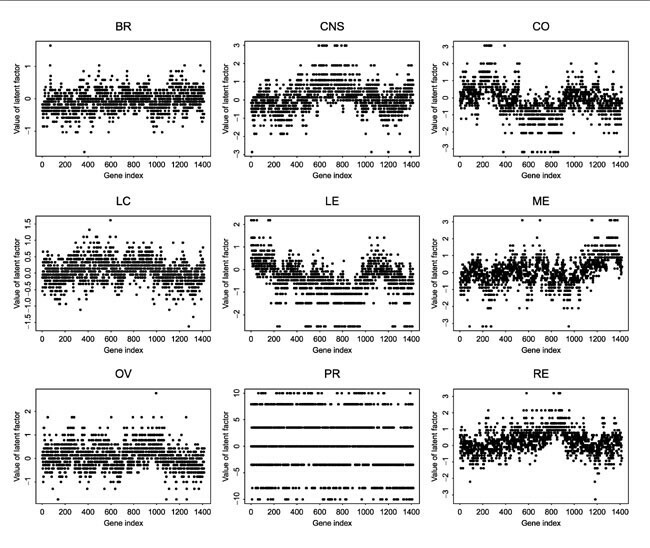 These covariates are then used in the standard regression models for model fitting and prediction. West et al. proposed a Bayesian binary regression approach using the singular value decomposition to first reduce the dimension of the variable space (p) to the number of samples (n). They called the resulting linear combination of the expression levels of all the genes the expression of the 'supergenes'. All these approaches reduce the variable space by making one or several linear combinations of the expression levels of some or all of the genes. Linear combination may not, however, be the best way of reducing the dimension of the variable space. Another popular approach to analyzing gene expression data is to use clustering methods to simultaneously cluster both samples and genes in order to determine some clusters of genes that are mostly correlated with some clusters of samples. Examples of such an application include analysis of gene expression data and drug response for the 60 human cancer cell lines of the National Cancer Institute (NCI60 data) , and analysis of cancerous and normal colon tissues . However, the clustering approach is purely exploratory and requires an external similarity measure. Methods that can be used to assess the significance of the clustering results are needed. The Rasch model (RM) and its extensions [6,7] are an important staple of psychological research and are used in other fields such as sociology, educational testing and medicine. The idea of the RM is that one can indirectly infer a person's position on a latent trait from his/her responses to a set of well-chosen items. For example, the RM has been used to infer the quality of life of cancer patients from their answers to a well-designed questionnaire , or to measure disability from activities of daily living . For these applications, data are usually given in a matrix, with rows being individuals and columns being responses to a set of items. Microarray gene expression data are also given in a transposable matrix form with rows being genes and columns being samples, and vice versa. The RM can therefore be used to explain the observed patterns over different columns. Here we propose two different formulations of the polytomous RM for analysis of microarray gene expression data. The first formulation treats samples as 'persons' and genes as 'items'. The idea is to infer several latent factors associated with a given sample on the basis of its expression profile over many genes. We combine a model-based clustering method  with the RM to define a small set of latent factors associated with samples. For a given sample, we assume that genes in the same cluster determine one latent factor associated with this sample, and use the RM to estimate this latent factor for each gene cluster. These latent factors are then used in a regression analysis of the observed phenotypes. The rational of this approach is that genes of similar function yield similar expression patterns in microarray hybridization experiments [11,12,13]. Co-regulated genes may share similar expression profiles, maybe involved in related functions or regulated by common regulatory elements . Therefore, if genes are clustered together, it is impossible from a statistical point of view to differentiate one gene from the other. In this case, a better way of studying these genes is to treat them as a cluster. Consideration of genes in the same cluster can potentially reduce noise associated with a single gene. The second formulation is to treat genes as 'persons' and samples as 'items'. The idea is to infer several latent factors associated with each gene based on its expression levels across samples from different tissue or cell types. This formulation provides simple summary statistics for genes based on their expression profiles over samples, and helps to identify genes that are more likely be over- or underexpressed within samples of the same type or between samples of different types. We first briefly review some key ideas of the polytomous RM and its estimation. We then present two different formulations of the RM for the gene expression data. Details involved in these formulations are given. We apply our proposed methods to the analysis of the leukemia dataset  and the NCI60 dataset  and conclude with discussion of our method. Example of Rasch probabilities as a function of the value of the latent factor for an item with four different response categories for two different sets of item-specific parameters (a) β = (0.3,0.5,-0.5,0) and (b) β = (-0.3,-0.5,0.5,0). Therefore, there is a total of Jm - 1 unconstraint item-specific parameters. The item parameters can be estimated based on the conditional likelihood, given minimal sufficient statistics for the person parameters. For a given person, the minimal sufficient statistic is the sum of the category weights corresponding to the observed responses. After the β parameters are estimated, the person parameters can then be estimated by maximizing the likelihood function. Details on the conditional likelihood estimation of the item parameters can be found in Anderson . Typical microarray data consist of expression levels for a large number of genes on a relatively small number of samples. Let x ij be the gene expression level of the jth gene in the ith sample, for i = 1,..., n, and j = 1,..., p. In practice, n is usually much smaller than p. For spotted arrays, to moderate the influence of gene expression ratios above and below one, we may apply the natural log transform to all the red to green ratios . Upregulated genes thus have a positive log expression ratio, whereas downregulated genes have a negative log expression ratio. Or x ij might be the expression level from an oligonucleotide array. In addition, for the ith sample, we have observed phenotype y i , which could be a binary indicator such as two different types of cancer, a continuous measurement such as drug-response activity or censored survival time such as time to tumor recurrence. To apply the RM to the gene expression data x ij , we first need to discretize the gene expression levels x ij into z ij , which takes value from 0,..., m, for i = 1,..., n, j = 1, ..., p. In practice, we can use the quantiles or the quantiles within quantiles as cut-off points for discretization. Because this approach uses only ranks rather than the actual expression levels, there may be slight loss of information. However, in return, we gain a valid analysis with robustness to the outliers. Our goal is to infer several latent factors associated with each sample based on its gene expression profile, and relate these latent factors to the observed phenotypes. Using the terms of the RM, we treat each gene as an 'item', each tissue sample or cell line as a 'person', and treat the expression level as the response of a given tissue to a given gene. The unidimensional RM may not, however, hold for the complete set of genes generated by microarrays. Here we assume that genes with similar expressions determine one latent factor, and that the RM holds for each set of genes with similar expression profiles. To identify genes with similar expression profiles over samples, we first use the model-based clustering method of Fraley and Raftery  to cluster p genes into K clusters based on their gene expression profiles over n samples. Note that the cluster-step is performed based on the observed continuous gene expression data, not the discretized gene expression patterns. For a given sample, using expression profiles of genes in a given cluster, we estimate a latent factor by fitting a RM. These latent factors are then used in a regression analysis to study the relationship between the gene expressions and the phenotype. The method allows to investigate whether a cluster of genes with similar expression profiles is related to the observed phenotypes, and can also be used for future prediction by estimating the latent factors using the maximum likelihood estimation. We give some details for each of these steps in the following sections. where the τ k is the probability that a gene belongs to the kth cluster, and φ n (X|μ k ,Σ k ) denotes the density function of the multivariate normal distribution with mean μ k and variance-covariance matrix Σ k Possible parameterization of the covariance matrix is discussed in Fraley and Raftery . Note that if we assume a simple covariance structure, Σ k = λ I, where I is the identity matrix, and λ is the variance, then the model-based clustering method becomes the K-means clustering method . where L(K) is the maximized log-likelihood, n k is the number of independent parameters to be estimated in the K-cluster model and p is the sample size (number of the genes). We will choose K that gives the maximum BIC(K) value. As the first step of our approach, we cluster genes into K clusters using the model-based clustering method described above, where the number of gene clusters K is determined by maximizing the BIC scores. Let C k denote the genes in cluster k, and p k denote the number of genes in this cluster, for k = 1,..., K.
We fit a RM model as in equation (1) for genes in each of the K clusters respectively, treating samples as 'persons' and genes as 'items'. To fit the RM (equation 1) for genes in the kth cluster, we let i be the sample index, and j be the gene index, for i = 1,..., n, and j = 1,..., p k , and let α i = α ik in model (1) be the latent factor for the ith sample which is determined by the genes in the kth cluster, and β jl be the gene-specific parameter for the jth gene. The RM assumes that the variation of the gene expression patterns observed over different samples is due to a latent factor, and it provides a probabilistic model to describe the gene expression pattern for a given sample. for i = 1,..., n, where γ is the vector of regression parameters, ε i , is the error term, and the actual model of the regression function (f) and the distribution of the error depend on type of the phenotype. If the phenotype is a continuous variable, linear regression can be used, if it is a binary variable, logistic or probit regression can be used, and if the phenotype is survival time, the Cox regression model can be used. Alternatively, the generalized linear model can be used. One advantage of the proposed method is that we can model the interactions between the latent factors in the standard way of modeling interactions in the regression models. As only the estimated and not the observed latent factors are available in the regression model (equation 3), the variance of the estimate of the γ parameter has to be corrected. We propose to use a two-step bootstrap resampling procedure  to estimate the variance of the estimate of the parameter γ in the regression model. First, within the kth gene cluster, we resample genes and re-estimate the α ik parameter by fitting the RM (1). Second, for a given set of estimated α parameters, we resample the n samples from (y i , i ), for i = 1,..., n, and fit the regression model (equation 3) to obtain a new estimate of γ. We can then estimate the variance of with these resampled estimates. jh is the estimated gene-specific parameter for gene j in the kth cluster based on the training sample. Using the estimated vector of the latent factors , the regression model (3) can then be used for predicting phenotype Y new . The second formulation of the RM for gene expression data is to treat genes as 'persons', and samples as 'items'. Assume that we have gene expression data of p different genes, indexed by i, over n k samples of the kth sample type, indexed by j, for k = 1, ..., K. Note that the indices i and j are used differently from the previous sections. We are interested in identifying genes that are expressed differently among these different sample types. Here each gene has its own expression patterns over different samples. For gene i, we can estimate a latent factor α ik based on its gene expression profile over n k samples from the kth sample type by fitting the RM (equation 1), for k = 1, ..., K. In this formulation of the RM, we treat genes as 'persons', treat samples as 'items', and treat each gene's expression level over samples as the responses. In RM (1), I = p, and J = n k , α i = α ik , which is the latent factor for the ith gene determined by the samples of the kth type, and β jl is the sample-specific parameter. This model assumes that the variation of gene expression patterns across different samples among different genes is due to several gene-specific latent factors. Here the latent factor α ik can be interpreted as some quantities related to the transcription factors of the ith gene which determine the gene expression levels in samples of the kth sample type. For a given tissue or cell line type k, genes with larger estimated latent factor (α ik ) tend to have higher expression levels than those with smaller estimated latent factor. For a given sample type k, the estimated latent factors, ( 1k}, ..., pk ), provide a nice way to order genes based on their expression levels over a small number of samples of sample type k, and to identify genes that are relatively over- or underexpressed in the kth sample type. In addition, by comparing the estimated latent factors associated with genes across different sample types, we can identify genes that are differentially expressed among different tissue or cell line types. We applied the proposed approach to the problem of classifying acute leukemias. Acute leukemias can broadly be divided into two classes, acute myeloid leukemia (AML) and acute lymphoblastic leukemia (ALL), that originate, respectively, from cells of myeloid or lymphoid origin. The two diseases appear identical under the microscope. However, correct diagnosis is critical, as they respond best to different treatment regimens. Golub et al. used a set of 38 leukemia samples including 11 AML and 27 ALL as training samples set, and used an additional 34 samples (14 AML, 20 ALL) as a test set for testing their proposed method for class prediction. In our analysis, we combined both the training and the test datasets into a dataset of 72 samples (25 AML and 47 ALL). For each of the 72 samples, the gene expression data were extracted from Affymetrix expression arrays. We first selected the subset of 3,571 genes based on an initial processing adopted by the authors of the leukemia study. The expressions summarized are the log (base 10) values of the actual expression levels following this initial filtering and transformation. We then select 50 genes that are mostly over-expressed in AML, and 50 genes that are mostly overexpressed in ALL by using the Wilcoxon rank sums test. This simple rule of selecting a smaller set of genes are also used in Golub et al. using slightly different tests. As expected, the model-based clustering method assuming the common covariance matrix clusters these 100 genes into two clusters, with 50 genes in each cluster. The left plot of Figure 2 shows the gene expression levels of these 100 genes for the 72 leukemia samples. Clearly, these 100 genes are highly differentially expressed between the two types of the leukemia samples. (a) Log (base 10) of gene expression levels of 100 genes chosen using the Wilcox rank sum tests for the leukemias dataset. Darker spots indicate higher expression levels. The first 47 samples along the x-axis are ALL, the next 25 samples are AML. Genes are selected to best separate the two types of leukemias. (b) Plot of two latent factors estimated using the Rasch model for all 72 samples based on their gene expression profiles over 100 genes selected. Given the 100 genes selected, methods such as principal component analysis, partial least-square regression or composite covariate predictor can be used to further reduce the gene dimension to two or three dimensions by taking linear combinations of the gene expression levels. Instead of taking linear combination of gene expression levels, we first discretize the expression levels of all the 100 genes over 72 samples into four categories using the quantiles as the cut-off points. Therefore, for each gene, their expression level can take one of four possible values of 0, 1, 2 and 3. The same analysis was also done by discretizing gene expression levels into eight categories, the results were essentially the same. In the following, we only present the results using four categories. Fitting two RMs to these discretized gene expression levels, we estimate two latent factors for each sample; one latent factor is determined by gene expression profiles of 50 genes in one cluster, the other is determined by the gene expression profiles of 50 genes in another cluster. The right panel of Figure 2 shows the estimated values of these two latent factors for all the 72 samples. This plot shows that the two leukemia types are well separated by these two latent factors, with no overlap, except that two leukemia samples, one from ALL group and the other from AML group, are close to each other in this two-dimensional space. Discriminant analysis using these two latent factors would expect to perform very well in classification. We performed a leave-one-out cross validation analysis to estimate the misclassification rate. Specifically, we leave one sample out, and first estimate the sample-specific latent factors α ik for the ith gene for k = 1,2 and gene-specific parameter β jl using the remaining samples. We then estimate the latent factors of the left-out sample by maximizing the likelihood function (Equation 4). Fisher's linear discriminant analysis using the estimated latent factors was then used to classify the left-out sample. The above procedure was applied to each of the 72 samples, and resulted in a misclassification rate of 2/72 = 3%. We use this example to demonstrate that two latent factors carry most of the information of the gene expression levels of the 100 genes. In order to study the difference of the gene expression profiles between the ALL and AML samples, we fit two RMs treating genes as 'persons'. The first model uses the ALL samples as 'items', and the second uses the AML samples as 'items'. Therefore, for each gene, we obtain two latent factors, one based on the gene expression profiles of ALL samples, the other based on the gene expression profiles of AML samples. 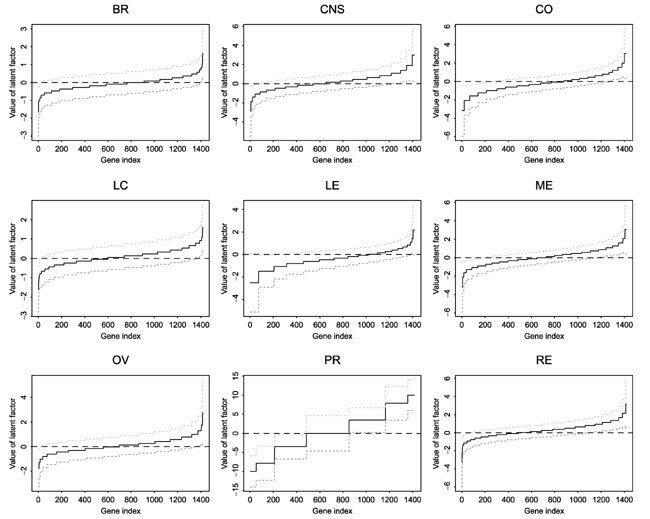 Figure 3 plots the estimated latent factors for each gene together with the 99% point-wise confidence intervals. From these two plots, we conclude that the gene expression levels of most of the genes (genes with 99% confidence intervals containing zero) are not significantly different in both AML and ALL samples. For the ALL samples, 189 genes expressed at lower level and 164 genes expressed at higher level compared to the rest of the 3,753 genes. For the AML samples, 92 genes were expressed at lower level and 94 genes at higher level compared to the rest of the 3,920 genes. (a) Estimated latent factor and its 99% confidence interval for each gene based on its expression profile over the ALL samples. (b) Estimated latent factor and its 99% confidence interval for each gene based on its expression profile over the AML samples. For each plot, genes are ordered in the increasing order of the estimated latent factor. Genes between the two vertical lines are those whose expression levels are not significantly different. For a given leukemia type, genes with 99% confidence interval of the estimated latent factor not including zero show significantly different expression from those genes with 99% confidence interval of the estimated latent factor including zero. In order to see the difference of gene expression between ALL and AML samples, the two estimated factors are plotted on the left in Figure 4. Genes in the upper left quadrant tend to have higher gene expression level in AML, but lower expression level in ALL. On the other hand, genes in the lower right quadrant tend to higher gene expression level in ALL, but lower expression level in AML. The logarithm (base 10) of the gene expression levels of these genes are plotted on the right panel in Figure 4. Clearly, these genes are differentially expressed between the two type of the samples. Further examination indicates that all the 100 genes identified by the Wilcoxon rank-sum test are included in these genes. (a) Estimated latent factors for each gene using ALL and AML samples. Genes in the upper left quadrant tend to be overexpressed in the AML samples, but underexpressed in the ALL samples, and genes in the lower right quadrant tend to be overexpressed in the ALL samples, but underexpressed in the ALL samples. (b) Log (base 10) of gene expression levels for genes differentially expressed between ALL and AML samples. Scherf et al. reported the use of cDNA microarrays to assess gene expression profiles in a set of 60 human cancer cell lines that have been characterized pharmacologically by treatment with more than 70,000 different drug agents, one at time and independently. This dataset offers us a unique opportunity to relate variations in gene expression to the molecular pharmacology of cancer. The NCI60 set includes cell lines derived from cancers of colorectal (CO, seven cell lines), renal (RE, eight cell lines), breast (BR, eight cell lines), ovarian (OV, six cell lines), prostate (PR, two cell lines), lung (LC, nine cell lines) and central nervous system (CNS, six cell lines) origin, as well as leukemias (LE, six cell lines) and melanomas (ME, eight cell lines). In this analysis, we consider only the 90 drug subsets whose mechanisms of action is putatively understood, and their activity data are available from the Web. We used the 1,376 gene subset along with 40 individually assessed targets for the present analysis. These subset was selected by selective filters used in . These 90 drugs are listed in Table 1 of . They applied the clustering methods to cluster cell lines basing on both gene expression profiles, and the drug expression profiles. The phenotype of interest is chemother-apeutic susceptibility, as measured by -log GI50, where GI50 measures the dose needed to cause 50% growth inhibition. We first cluster the 1,476 genes using the model-based clustering method described previously using the original data of the log-ratios. The BIC scores in the upper left panel of Figure 5 indicate that there are four gene clusters, with 307, 312, 323 and 474 genes in each cluster, respectively. As a comparison, we also applied the hierarchical clustering method to cluster these genes. The dendrogram shown in the upper right plot of Figure 5 also indicates four gene clusters. For each cell line, a latent factor is estimated using the RM, based on the gene expression levels of the genes in each of the four clusters. To fit the RM, we discretize the gene expression levels into four categories using the quartiles. The same analysis was also done with eight catagories, and the results are the same. The lower left plot of Figure 5 shows the levels of these four latent factors sorted by cancer types. In general, cell lines with the same origin tend to have similar levels of the latent factors; therefore, these factors can be used for discriminating among the nine different cell lines. However, for the third latent factor, the cell lines MDA-MB-435 (derived from the pleural effusion of a patient with breast cancer) and its Erb/B2 transfectant MDA-N have similar levels to those of latent factors estimated for the melanoma cell lines. 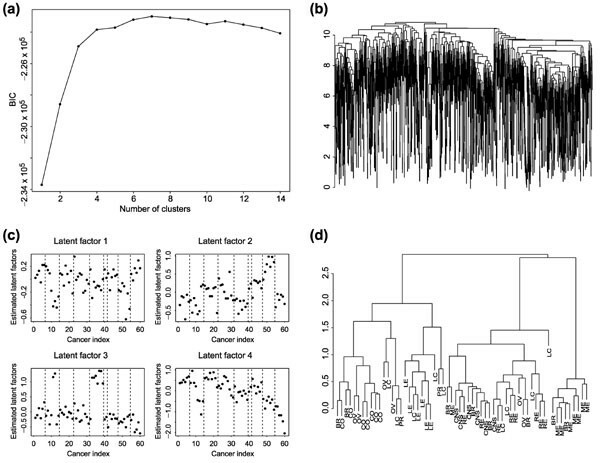 To verify the utilities of these latent factors in clustering cell lines, we performed the hierarchical clustering analysis based on these four factors (see lower right plot in Figure 5). We note that the two breast cancer cell lines are clustered together with melanomas. Hierarchical clustering analysis using all the genes also resulted in clustering these two cell lines with melanomas. In general, cell lines of the same origin are clustered together on the basis of the four latent factors estimated with the RM. The clustering result of the cell lines using these four factors are similar to the clusters obtained using all the genes (see ). (a) BIC scores as a function of the number of clusters for the NCI60 dataset. (b) Dendrogram showing hierarchical clustering of the genes. (c) Four latent factors estimated by using the Rasch model. The cancer indexes are sorted by cancer types as CNS, BR, RE, LC, ME, PR, OV, CO, LE (see text for abbreviations). (d) Dendrogram showing hierarchical clustering of cell lines based on four latent factors estimated by using the Rasch model. drug activity = μ + γx latent factor. The left panel of Figure 6 shows the estimated γ value together with point-wise 99% confidence interval for each of the 90 drugs using one of the latent factors as a predictor. The variance of the regression parameter β and the 99% confidence interval was estimated using the bootstrap procedure, where 50 resamples of genes in each cluster and 50 resamples of samples were used. For each latent factor, greater positive parameter estimate implies that higher gene expression level in a given gene cluster corresponds to a higher drug activity. For a given latent factor, drugs with 99% confidence interval of the estimated γ parameter not including zero are those whose activities are related to genes which determine this latent factor. (a) Parameter estimate and the bootstrap 99% confidence interval of simple linear regression parameter γ for each of the 90 drugs and for each latent factor. For a given latent factor, drugs with 99% confidence interval of the estimated γ parameter not including zero are those whose activities are related to genes which determine this latent factor. 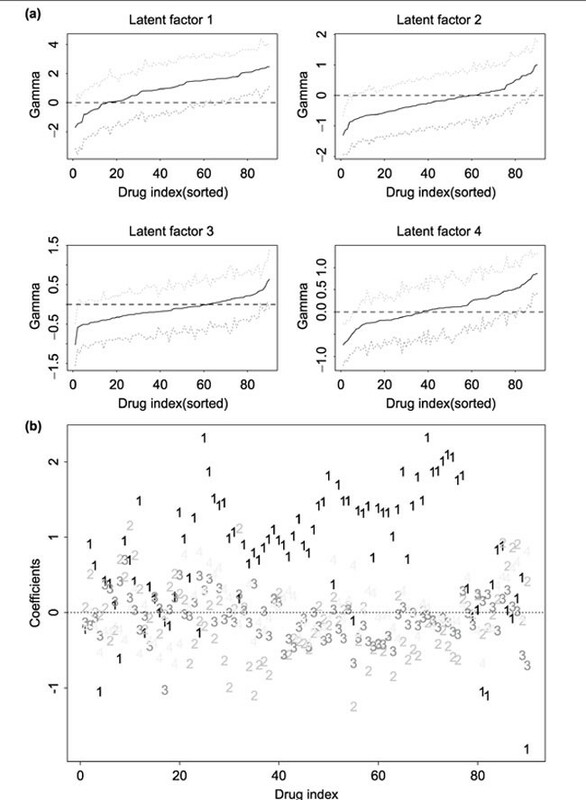 (b) Parameter estimates (for each drug, four regression coefficients for four latent factors) of multiple linear regression for each of the 90 drugs. In order to relate the drug activity of a given drug to all the four latent factors, we performed multiple linear regression analysis where drug activity for a given cell line was treated as a response variable, and the four latent factors were treated as the predictors. The right plot of Figure 6 shows the estimates of the parameters in the multiple regression model for each of the 90 drugs. This plot can be used for selecting drugs that are related to gene expression profiles. For example, only drugs with at least one large parameter estimate are important for further study, as only for these drugs, their activity levels are related to gene expression profiles. It is also interesting to identify genes that are over- or under-expressed relative to other genes for a given cell line type. Using the RM, we treat genes as 'persons' and cell line samples as different 'items', and estimate the latent factor for each gene based on its expression profiles over all the samples of a given cell line type. Figure 7 shows the estimated latent factor for each gene based on the gene expression profiles over each of nine different cell lines. These estimated latent factors provide a summary of gene expressions over different cell lines. Clearly, the gene expression profiles are different across different cell line types. Estimated latent factor for each gene and each cell line type. Genes are in the same order across different cell lines to show that genes have different values of the latent factors, and therefore, different expression profiles across different cell line types. See text for abbreviations. For a given cell line type, we can also infer which genes are over- or underexpressed compared to other genes based on the estimated latent factors. Figure 8 shows the estimated latent factor and the point-wise 99% confidence interval for each gene for each of the nine cell line types. For a given cell line, genes with 99% confidence interval of the estimated latent factor not including zero show significantly different expression from those genes with 99% confidence interval of the estimated latent factor including zero. For example, for breast cancer cell line, the method identified 15 genes or expressed sequence tags (ESTs) that are relatively overexpressed (the estimated latent factor is greater than zero, and is significant at the 0.01 level) and 23 genes or ESTs that are relatively underexpressed (estimated latent factor is less than zero, and is significant at the 0.01 level) in the breast cancer cell lines. Table 1 lists the known genes. Interestingly, we note that genes that are overexpressed include p53, and genes that are underexpressed include that for tumor-associated antigen CO-029. On the basis of our analysis, all other genes have similar gene expression level in the breast cancer cell line. Genes that are over- or underexpressed in other types of cell line can be similarly identified. Estimated latent factor and the associated point-wise 99% confidence interval for each gene and each cell line type. For cell line type, the genes are sorted by the estimated value of the latent factor. For a given cell line, genes with 99% confidence interval of the estimated latent factor not including zero show significantly different expression from those with 99% confidence interval of the estimated latent factor including zero. See text for abbreviations. We have described two different formulations of the RM for relating gene expression data to phenotypes. The RM provides a probabilistic model to describe the observed gene expression patterns. The first formulation can be used for cancer class prediction, and for identifying clusters of genes with similar expression profiles that are related to drug responses. The method is based on a combination of clustering analysis, the RM and the regression analysis. The second formulation can be used for identifying differentially expressed genes from different types of sample. We applied this method to a publicly available leukemia dataset to demonstrate the application of the proposed method for class prediction. We also applied this method to an analysis of the NCI60 data to show that the method can also be applied to other phenotypes. The method introduced here has several advantages. First, it provides a probabilistic model for describing the gene expression patterns. These models are used to reduce the complexity of the raw data and offer a certain degree of simplification. In contrast to most of the currently available methods for gene expression data, such as principal component analysis, the model used here provides a non-linear method for dimension reduction. Second, compared with traditional density-based models, the method is more robust to outliers, as it uses ranks rather than actual expression levels. There is a long sequence of steps in the laboratory as well as in the image analysis before a single number is produced for an expression level, and there are many potential sources of error. Methods that use ranks rather than the original measured gene expression data are also advocated by A Tsodikov, A Szabo and D Jones (unpublished data) and Park et al. . Third, in contrast to clustering methods for simultaneously clustering both genes and samples, the model-based approach allows formal estimates of the variance and therefore facilitates formal tests of null hypotheses and assignments of confidence intervals. There are several limitations to the proposed approach. First, in order to apply the RM, the gene expression levels are dis-cretized. It is clear that by discretizing the measured expression levels we are losing information. Certainly, additional information is present in the level of gene expression, but normalization or scaling errors across subjects or slides make it difficult to determine the precision of these numbers. We believe that discretization provides a reasonably unbiased approach for dealing with this type of data. For both the leukemia and NCI60 datasets, we fitted the RMs by discretizing the gene expression levels into both four and eight categories, and obtained essentially the same conclusions. Of course, the more categories we use, the closer are the discretized data to the real continuous data. However, this will introduce more parameters to the model. Second, this approach assumes that genes can be clustered into several subgroups based on their expression profiles over samples. This might not be true for some studies. In this case, we can consider all the possible clusters of genes in a step-wise regression analysis as proposed by Hastie et al. . Third, we used the bootstrap resampling procedure to estimate the variance of the regression parameter β after we have clustered genes into several classes. This procedure does not account for possible variability associated with the clustering step, and therefore, the bootstrap variance estimates are likely to be underestimated. In our proposed method, the clustering, the Rasch modeling and the regression analysis are done separately. Important research for the future is to take a joint likelihood approach that can combine all three steps to obtain better estimates of the number of clusters, the latent factors and the regression parameters. This kind of mixture RM provides a natural framework for unifying statistical inference and clustering. We are currently carrying out research in this direction. In conclusion, we demonstrate here the potential application of the RMs in analysis of gene expression data. RMs provide a probability model for describing gene expression profiles measured over different samples or over different times. We are currently exploring various other formulations of the microarray gene expression problems in the framework of the RMs, including class discovery in cases of hidden taxonomies based on the estimated latent factors using the RM. This research is supported in part by an NIH grant (ES09911) and a UC Davis Health System Research Award grant.